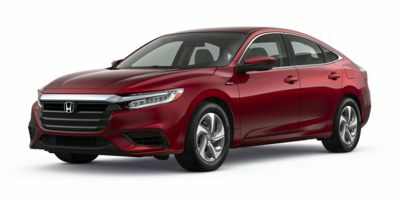 The 2019 Honda Insight has a great look that's contemporary with the compact and midsize sedan segments. Its look is very akin to the Accord, with a rounded front fascia, thinly slotted grille, narrow headlamps featuring the Honda "swoosh" daytime running lights, and a sporty lower aero scoop. The Insight's hood is proportional to the car with heavy indents to promise good airflow and speed. Body panels on the 2019 Insight are simple, but nicely done with an upscale feel about their austerity. The raked windscreen and fast-paced roof line help accent that appeal while the rear fenders and wheels pushed to the edge accentuate the fastback roof style and clipped deck lid at the rear. Narrow side mirrors, tight wheel wells, and speed lines give the 2019 Honda Insight a very appealing look overall that translates well to the segment. Honda has made a name for themselves in maximizing interior space for the vehicle's size. The Insight benefits from that expertise, having a far roomier interior than its exterior dimensions might promise. Space is utilized very well in the 2019 Insight thanks to a functional, ergonomic design. For the driver and front passenger, there is ample room for getting comfortable in the Insight. Front legroom is very good and headroom is much more plentiful than expected. Adjustments are well done and easy to accomplish. For the driver, steering wheel controls are intuitively laid out and drive controls are, for the most part, obvious and straightforward. The exception is the push-button gear selection, which seems gimmicky in that it does not save any space and requires one to look down to make sure the right button is being pressed (or pulled, in the case of reverse) at the right time. With wide doors and a good entry height, the Honda Insight is easy to get in and out of. Even in the back seats. From there, though, the seats are a bit cramped. There's plenty of lateral room in back, with the bench accommodating three across when need be and two at the outboard positions very well. Knee height and sitting position are very good in the back seat of the Insight. Headroom, however, can be cramped for taller folks, so anyone over six feet may need to get used to the close topper. We like that even when the front seats are at their lowest point, there is enough room for someone wearing boots to get their toes under the seat to maximize knee room in the back. Parents will also appreciate the easy access to tether points and LATCH anchors for child safety seats. 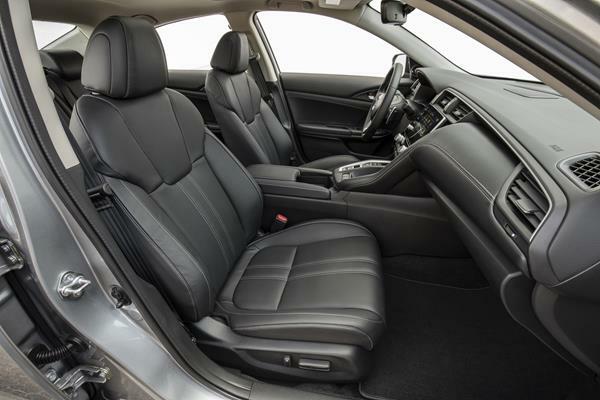 The rear bench is deep enough that a rear-facing seat will not impact how far the driver or front passenger can move their seat back. The trunk in the 2019 Insight is nice and large with plenty of room for a lot of stuff. This capacious trunk is not impeded by batteries and the folding seats to add more are not impacted either. Nice touch there. A low loading sill and wide opening finish the job for maximum cargo capacity. Honda has taken it up a notch with their infotainment for this new generation. 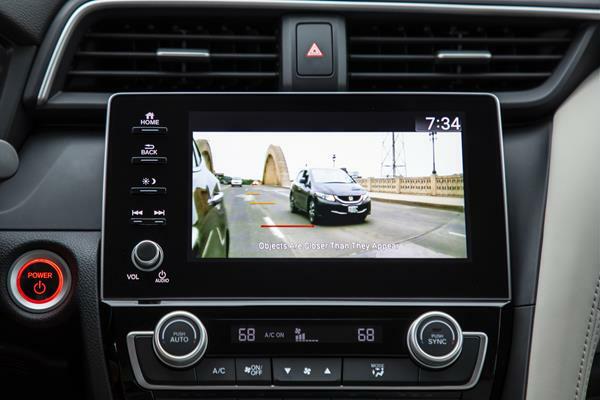 The 2019 Honda Insight features this latest evolution of that system, offering faster responses and a clearer, more robust screen. Apple CarPlay and Android Auto are standard in the middle and top-most trims of the Insight and plenty of ways to connect a device are clearly shown and utilized. The touchscreen interface supports tablet-like pinch and swipe gestures, which improves use immensely. The hard keys on the screen's edge and the use of a volume knob (missing on previous-gen Hondas) adds a lot to the ease of use for the Insight's infotainment. Two USB ports and a 12-volt plug are standard in the Insight with more being offered in the upper trim. At the end of the day, the point of an electrified vehicle is to maximize fuel economy. 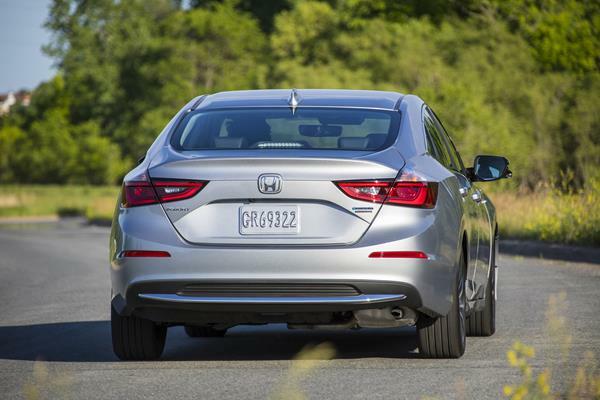 The 2019 Honda Insight has excellent EPA ratings for MPG returns at 55 mpg in the city and 49 mpg on the highway. In our week with the 2019 Insight, we achieved an overall average of 51 mpg with a split mix of city and highway driving. Thus far, there are no predicted reliability or dependability ratings for the 2019 Insight. The Honda brand overall is generally considered a good and reliable automaker and the other models similar to the Insight, namely the Accord and Civic, are rated well for dependability. The 2019 Insight being all-new, however, gives us little to go on for expectation in this regard. 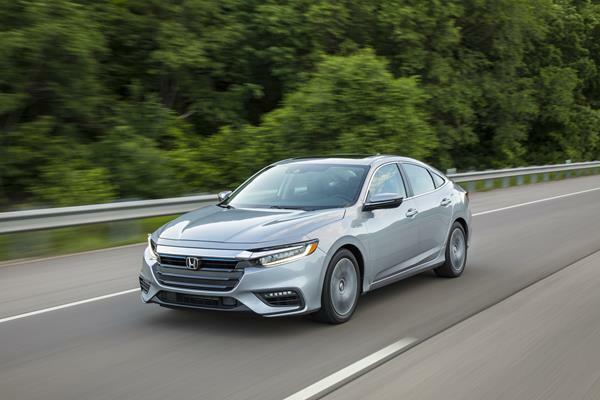 The 2019 Honda Insight has received top marks from both the National Highway Traffic Safety Administration (NHTSA) and the Insurance Institute for Highway Safety (IIHS). The NHTSA has rated the 2019 Insight with a top score of five stars overall for crash test results, including five stars each for frontal, side, and rollover tests. The IIHS has also given the Insight top scores of "Good" on all published crash test results and a "Superior" rating for its advanced frontal crash prevention systems. Resulting in the 2019 Insight being chosen as a "Top Safety Pick+" winner. Considering its purpose, the 2019 Honda Insight is very good on performance compared to other hybrid options with similar efficiency. The Insight is powered by an electric motor and an electronic continuously variable transmission (e-CVT) that receives power from a 1.1 kWh battery pack (located under the rear seats) and a 1.5-liter four-cylinder engine. 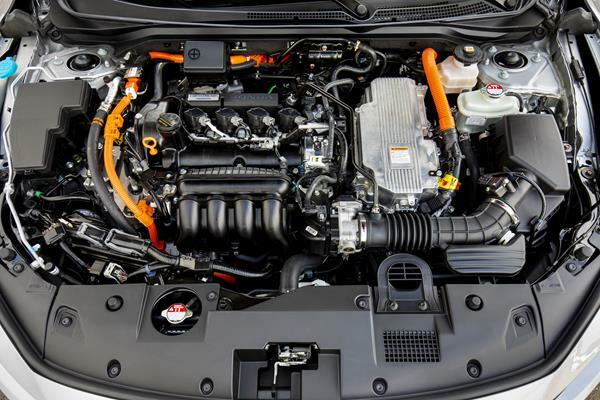 We list the electric motor and battery first because the Insight is primarily motivated as an EV with the combustion engine acting as a secondary rather than primary mover. A total of 151 horsepower are available and a nice 197 pound-feet of torque. That latter number comes largely because of the motor, which gives the Insight a good off-line acceleration feel thanks to that instant from-zero torque. Acceleration to 60 mph is about 8 seconds, which is great for a hybrid in this class. Out in the real world, the 2019 Insight is peppy and confident with a lot of good driving metrics for the class. There are sportier options, of course, but they'll have half the fuel economy of the Insight, whose primary competitor is known more for its brick-like handling and extreme focus on fuel efficiency than it is as a fun drive. The Honda mixes both very well. On the road, the 2019 Honda Insight feels good to drive as an everyday vehicle. It's not a sports car, obviously, but it's not a slouch either. Especially in normal driving modes. Switching to Eco mode maximizes efficiency (resulting in better than EPA expectations most of the time) while sacrificing that punchiness off the line. Some may find that a better option, especially in daily commuting where efficiency might be the top goal to achieve. Our chief complaint with the 2019 Insight is with how loud the engine gets on the highway. Road noise is not bad for the class, but the engine and transmission can sound stressed at freeway speeds. The Insight is otherwise an excellent drive. With a low starting price competitive with most standard compact and midsize sedans and a good mid-level price for excellent value, the Insight hits the mark very well for this metric. The mid-level EX model is priced below $25,000 with plenty of inclusions for most buyers while the top-level Touring model is fully loaded at a price point below $30,000. Given the car's excellent fuel economy, solid daily drive dynamic, and good versatility, we are rating the 2019 Honda Insight highly for pricing and value. 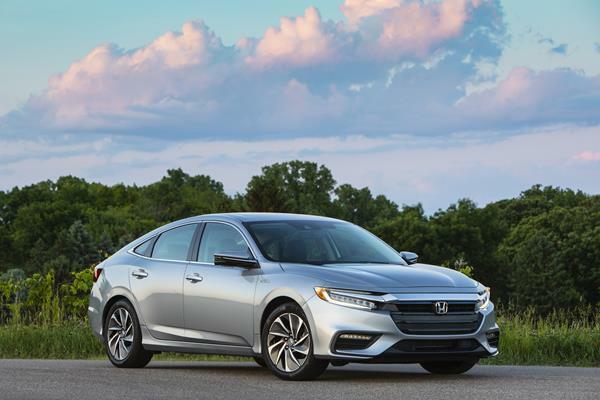 The 2019 Honda Insight competes against some well-done hybrids, which are now gaining popularity in the compact and midsize markets. The Toyota Prius leads the way, but is far less enjoyable and not quite as versatile as is the Honda, though it does sport better fuel economy. The Hyundai Ioniq Hybrid is new to the field, but cross-shop worthy for its wonderful design and road appeal. The Kia Niro aims to be a crossover, but is more competitive with hatchbacks and is a compelling choice for its higher versatility and good drive appeal, though it's not as efficient as the Insight is. The 2019 Honda Insight has a lot of appeal and is a top rank for us thanks to that. Its contemporary, unobtrusive looks, good drive dynamic, and comfortable versatility are all high points. With excellent fuel economy and a "regular car" feel, the Insight hits the mark almost perfectly for compact and midsize sedan buyers. Interested to see how the 2019 Honda Insight ranks against similar cars in terms of key attributes? Here are the 2019 Honda Insight rankings for MPG, horsepower, torque, leg room, head room, shoulder room, hip room and so forth.